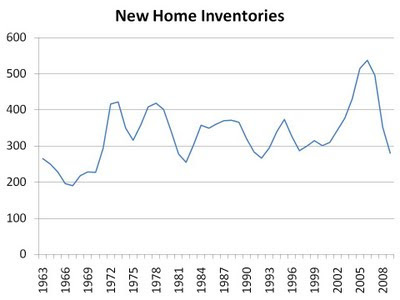 When measured per capita, new home inventories are as low as they've been in the last 50 years. Of course, this doesn't mean prices are going to rise any time soon. Continued foreclosures as a result of continued job losses will likely act as a drag on prices. However, these low inventory numbers (which continue to decrease) on new homes suggest the days of massive writedowns are also over. As such, investors can likely trust the book values of most home builders. As we saw earlier, stock prices of home builders tend to rotate around their book values over time, offering profit opportunities for those who buy at discounts. Of course, this doesn't mean all home builders are safe. Of the list we compiled showing homebuilder debt levels, several have already gone out of business. Further uncertainty also remains for builders who have large payments coming up and/or those who are dependent on specific regions. But for well-capitalized, diversified builders, the worst is likely over, and discounts to book value should serve as opportunities.